Whether you're a woman or a man, single or married, widowed or divorced, retiring early or late—the Social Security choices you make may have a significant impact on your retirement income. Different approaches can result in thousands of dollars in benefits gained—or missed—over the course of your retirement. And even though the Social Security rules for women and men are the same, your strategy doesn't have to be. Here's why. Women earn less, often with large discrepancies between their and their spouses' salaries. Women live longer, with the potential of spending extra years in retirement after the death of a spouse. "Women and Social Security in the United States," Lenore E. Bixby, Bulletin, September 1972, ssa.gov . Additionally, women are also more likely to leave the workforce (permanently or temporarily) to care for children or other family members, further slowing their earnings growth. The lifetime pay gap between men and women results in a gap in Social Security as well, since lower earnings equals fewer in benefits. Women are also less likely to be covered by private retirement plans or have pensions and are more dependent on Social Security benefits—even though their benefit amounts are lower. The pay gap between spouses matters for Social Security more than you'd think. When there's a large discrepancy in income, one spouse can delay filing to maximize benefits for both. 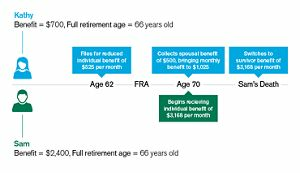 In this example scenario, Kathy files for early benefits starting at age 62, and Sam maximizes his benefit by waiting until age 70. Then, Kathy can file for spousal benefits later and increase her own benefit. This also allows her to maximize survivor benefits if she lives longer than Sam. The filing strategy utilized above represents an example of early filing combined with late filing to increase Social Security benefits. Results may differ depending on an individual's earnings history. Source: American Century Investments, ssa.gov. Former spouses are eligible for benefits based on an ex-spouse's income (if age 62 or older and unmarried, and the marriage lasted at least 10 years). In fact, if they've been divorced at least two years and are both working to age 62, one ex-spouse can receive benefits even if the other is still working. Not only do women live longer, but they're often younger than their husbands when they get married. That means women may live an average of four extra years in retirement without their husbands. Sources: Social Security Administration Life Expectancy Calculator, U.S. Census Bureau. Current Population Survey, 2016. HealthView Services 2017 Retirement Health Care Costs Data Report. Women may rely on survival benefits more than men due to the longer potential retirement length and lower individual benefit amounts. Surviving spouses receive the higher of either their own benefit or their deceased spouse's benefit. The couple must have been married for at least 9 months, and generally, the survivor must be at least 60 years old. What can you do to ensure your money covers expenses for both spouses deep into retirement? Make your plan as a couple rather than as individuals and take steps to account for life expectancy differences. Source: American Century Investments, 2019. Society of Actuaries and American Academy of Actuaries , March 2019. Even if you use strategies to maximize your benefits, Social Security may only replace about 40 percent of your past earnings. Make sure you have an investment plan that can complement your Social Security income. Contact an Investment Consultant to learn more about creating a comprehensive retirement plan. 1 "Social Security Is Important to Women ," ssa.gov, September 2018. 2 Life Expectancy Calculator , ssa.gov, March 2019. 3 Society of Actuaries, www.longevityillustrator.org .